The 2014 Asian Games, officially known as the XVII Asiad, is the largest sporting event in Asia governed by Olympic Council of Asia (OCA). This is the 17th Asian Games. It will take place over 16 days in Incheon, Korea, from 19 September to 4 October, 2014. It will be the third time Korea has hosted the OCA’s showpiece event, following Seoul in 1986 and Pusan in 2002. The slogan for the event is “Diversity Shines Here”. It represents and highlights the significance of Asia’s wonderful diversity in history, cultures, and religions. There will be approximately 20,000 participants, comprised of 13,000 athletes and team officials from the 45 NOCs, and 7,000 media. Athletes will compete in 36 sports, including the 28 Olympic Games sports on the program for Rio de Janeiro 2016. Organisers will use 49 competition venues, including 23 new stadiums, and 54 training venues, 49 of which already exist. The ground-breaking ceremony for the 60,000-capacity main stadium took place on June 28, 2011, and work is expected to be completed by April 2014. There are 49 competition venues and 48 training facilities were used during the Games. Among the 49 competition venues, ten venues featured in six cities of Gyeonggi Province while another two featured in Chungju and Seoul. The rest of the venues featured in eight district and a county inside the metropolitan city of Incheon. Ten venues were constructed for the Games. The Games also provide athletes’ and media villages that cater for over 3,300 units and 9,560 rooms. Athletes’ Village: 13,000 athletes and officials, 16km from Main Stadium. Two people per room. Media Village: 2,600 media, 16km from Main Stadium. 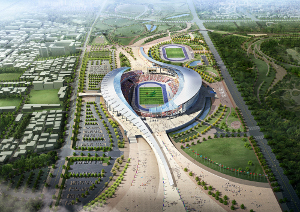 The main stadium, known as Incheon Asiad Main Stadium, is completed. It will be used for the Opening and Closing Ceremony and Athletics competitions. It has an all-seated Games capacity of 61,074 seats, before reducing to a single-sided grandstand for 30,000 afterwards as a People’s Park for the city of Incheon. The legacy plans were always based on a community park, which after the Games, will replace the Eastern stand, forming a traditional stadium hill, with plazas on the north and south ends. The US$400 million multipurpose stadium, originally planned for 70,000 seats, was designed by Populous in association with local firm Heerim Architects. Populous has designed many events stadia including the Olympic Stadium for the London 2012 Summer Olympics and Sochi 2014 Winter Olympics Fisht National Stadium. The groundbreaking ceremony was held on 28 June, 2011 in Yeonhui-dong, with construction beginning in June 2011. The opening ceremony will be held from 19:00 to 22:00 local time on 19 September, 2014. The performance will combine the elements Korean traditional culture and modern technology. The closing ceremony will be held from 19:00 to 21:30 on 4 October, 2014. Cost of the Games was estimated at approximately US$1.62 billion, with the Korean government and Incheon (city) government covering 19% and 78.9%, respectively. Of the total budget, some US$1.39 billion was scheduled to be used for the construction of venues and infrastructure, while approximately US$11 million covers the building and maintenance of training grounds. Around US$103 million was to be used for road and transportation projects. The IAGOC trimmed the sports program for the Games and the number of sports was reduced from 42 to 36 – and consequently the number of venues from 53 to 49. This set a benchmark for future editions of the Games, to make them more cost-effective. Cost savings were made by reducing substantially the number of Athletes to be given free transportation and accommodation. 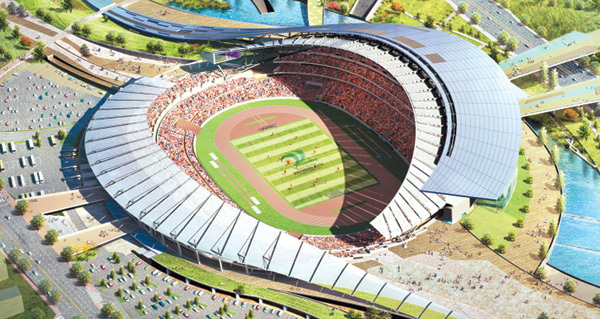 The central government initially asked Incheon to renovate the Munhak Stadium, which was one of the venues for the 2002 FIFA World Cup, to use as the main stadium for the Asian Games. The city, however, rejected the proposal and opted to build a new one. As of April, 2014, Minister of Culture-Sports-and Tourism, Hoang Tuan Anh, said that the cost for holding the event, not including infrastructure construction, could reach $150 million. The last Asian games — in Incheon, South Korea — cost $1.1 billion. The 2014 Incheon Asian Games social media platforms have attracted a total of 10.2 million visitors since it was launched almost a year ago. The Incheon Asian Games opened its official account on Facebook, Twitter, Kakao Talk, YouTube, Weibo and Youku social media networks, offering English, Korean and Chinese to attract fans from around the world. 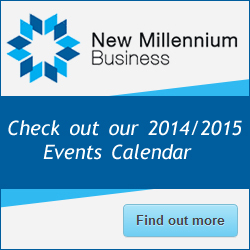 By April 2014, those six social media networks had attracted 2.258 million fans. In addition to this, the Incheon Asian Games also launched its official blog in English, Korean and Chinese. The monthly visitors in April 2014 reached 7.941 million – the highest monthly hit in 2014 and taking the total number of Incheon Asian Games social media fans to 10.2 million. RTDS (Real-Time Display System) Real-time results retrieval & display system will be used by athletes / commentators / media personnel /venue announcers and VIPs. It will provided for 8 Sports : Judo, Badminton, karate, Table Tennis, Taekwondo, Weightlifting, Wrestling and Wushu. Sports are still subject to change. Korea Broadcasting System (KBS) and Munhwa Broadcasting Corporation (MBC) have been selected as host broadcasters of the 2014 Incheon Asian Games, and their joint venture Incheon Host Broadcasting Management (IHB) was launched last May. In addition to KBS and MBC, 10 other Korean broadcasters and overseas broadcasters such as CCTV and HBS will participate in the international signal production of IHB. 50 outside broadcast vans and 520 cameras will be used to produce 70 broadcasting feeds in 36 sports competitions and events, including the Opening and Closing Ceremonies. HS Ad, a subsidiary of LG Group, was selected as the production agency for the Opening and Closing Ceremonies. The Asian Games News Service (AGNS) will be provided by Herald Corporation in Korean and English. The International Broadcasting Centre (IBC) will be housed in Songdo Convensia, the convention centre in the New Songdo City of Incheon, and the Main Press Centre (MPC) will be located in the Songdo International Business District Building adjacent to the Convensia. There will be Sub-Media Centers at the Games venues – 38 Sub-Broadcast Centres at competition venues, and 50 Sub-Press Centres, including those at Athletes’ and Media Village. The Opening /Closing Ceremony tickets for the 2014 Incheon Asian Games are categorised into 5 types. The price ranges from 1,000,000 KRW to 100,000 KRW. The match tickets are categorised by the sports and the seats. The price of the match tickets range from 100,000 KRW to 5,000 KRW. There is a 10% discount available for tickets purchased during the first presale period from this week to March 31, and 5% off during the second presale period from May 1 to Aug. 31. Also, for certain purchasers that meet the requirements, one can receive from 30% to 70% discount.